We’ve all seen enough movies to know that salespeople are often depicted as ruthless, corrupt, and hilariously corny. But sales movies can also capture the passion, energy, and ambition necessary to launch a successful career. There are plenty of reasons to appreciate cinematic portrayals of salespeople – from their human flaws and failings to their most outrageous schemes and rousing pitches. 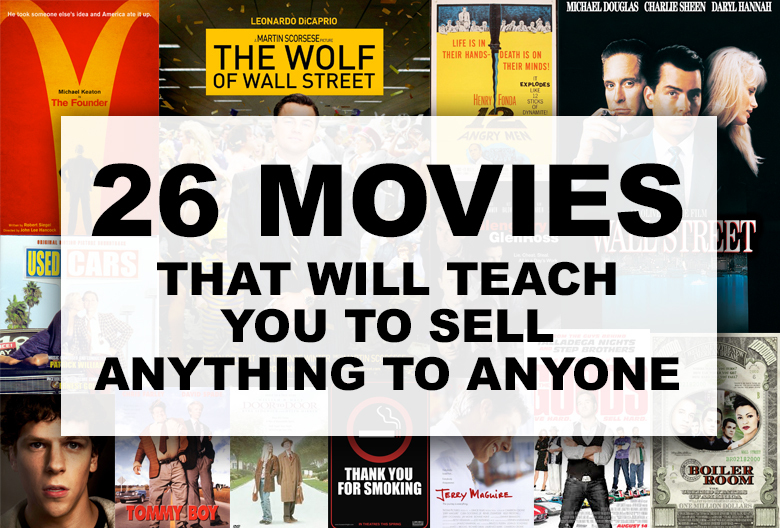 All stereotypes aside, we’ve rounded up 26 of the best sales movies that will teach, entertain, and inspire you! The true story of how an over-the-hill milkshake machine salesman stole McDonald’s from two brothers and turned it into a fast food empire of epic – no, supersized – proportions. How’d he do it? One word: persistence. With Nick Offerman and John Carroll Lynch as the McDonald brothers, Michael Keaton stars as the progressively unethical Ray Kroc. Fast-talking Randy Russo is a charismatic used car salesman with the catch phrase “Trust me!” Things get complicated when Randy’s boss lends him money right before suffering a suspicious accident. Kurt Russell stars in this high-energy satire about sales, rival car lots, and ruthless competition. Based on a play by Arthur Miller, the story of washed up salesman Willy Loman has been brought to life in three separate films. A tragic hero in almost every way, Loman’s plight reminds us that sales is a high-pressure, relentless game that not everyone has the guts to handle. The critically-acclaimed 1985 adaption stars Dustin Hoffman, Kate Reid, and John Malkovich. After he loses his job, breaks up with his girlfriend, and has a nervous breakdown, salesman Tommy Wilhelm is certainly down on his luck. Played by the late, great Robin Williams, Wilhelm moves to New York for a fresh start and attempts to balance personal issues with his desire for success. A workaholic’s life changes when she inherits a toddler. Consultant J.C. Wiatt, played by Diane Keaton, struggles to focus on her career while raising a child, but her challenges lead to new opportunities. Wiatt eventually discovers her calling as an entrepreneur and begins selling her own brand of baby food. This romantic drama offers an interesting perspective on medical sales. Based on the nonfiction memoir of a Viagra salesman, the story follows a pharmaceutical rep (Jake Gyllenhaal) as he becomes Pfizer’s top salesperson. Gyllenhaal shamelessly charms doctors, nurses, and whoever stands between him and success. A documentary about the rivalry between four door-to-door bible salesmen. Filmmakers Albert and David Maysles follow the four men as they travel across middle America, attempting to sell gold-leaf bibles to elderly folk and bored housewives. Malcolm McDowell stars as Mick Travis in this surrealist musical about a young coffee salesman. Mick is said to represent the everyman while the film itself serves as an allegory about the dangers of capitalism. This is a 1960 drama starring Burt Lancaster, Jean Simmons, Arthur Kennedy, and Shirley Jones. A salesman-turned-preacher, Elmer Gantry is the ultimate hypocrite and always peddling something – whether it’s shoeshine or sermons. Another flick starring Robin Williams, this comedy follows a used car salesman with too much on his plate. Not only is he at risk of losing his job if he can’t sell twelve cars ASAP, he’s also in trouble with the mafia. The wealthy Duke brothers place a bet on whether a homeless con artist can become a successful businessman. This comedy stars Eddie Murphy and Dan Aykroyd as two very different strangers who find their positions in life reversed for the amusement of two millionaires. Even if you’ve never seen it, you’ve probably quoted this movie without even realizing. “Show me the money!” is one of the best-known lines from any sales-related film. Tom Cruise plays a successful sports agent whose new perspective scares off all but one of his clients (Cuba Gooding Jr.). Two veteran salesman convince a member of the research department to help them land a whale of a client. However, their protégé has second thoughts about the scheme when his religious beliefs conflict with the salesmen’s tactics and cynicism. A struggling sales team flounders in this comedy about (yet another) a car dealership. That is, until Don Ready (Jeremy Piven) is hired to turn their Fourth of July sale into a wildly successful campaign. Easily one of the best sales movies of all time, Boiler Room is all about the hard sell. Giovanni Ribisi plays a college dropout who lands a job as a stockbroker. He quickly learns aggressive sales tactics that allow him to strong-arm clients into making decisions that benefit his firm. In this satirical dramedy, a big tobacco lobbyist (Aaron Eckhart) struggles to manage his professional obligations and still set a positive example for his son. He soon faces additional pressure when an aggressive anti-smoking campaign is launched to get poison labels placed on cigarette cartons. The legendary tale of real-life salesman Bill Porter (William H. Macy), a man who sold Watkins Products door-to-door for 40 years. Not only did Porter suffer from cerebral palsy and a speech impediment, but he was also disabled from being hit by a truck. He is remembered as a ruthless, tough sales veteran who didn’t let anything stop him from closing a sale. A film loosely based on the life of entrepreneur and inventor Joy Mangano, who tackled product design, narrow-minded executives, and legal trouble to become the founder of a powerful family-run business. Jennifer Lawrence, Bradley Cooper, and Robert De Niro star in this Oscar-nominated drama. Chris Farley and David Spade are a riot in this funny flick about a son who embarks on a cross-country road trip to save the family business. Unfortunately, Farley’s character is not the great salesman his late father was, which results in a series of hilariously bad sales calls. A high-energy ride of a film, Wolf of Wall Street chronicles the real-life story of corrupt stockbroker Jordan Belfort who experienced great financial success before serving 22 months in prison for his crimes. In one particularly memorable scene, Belfort challenges his team to come up with a sales pitch for his pen on the spot. A comedic look at what really goes on behind the scenes at used car dealerships, Suckers is something of a cult classic. Joe Yanetty, Jake Johannsen, and Daniel Benzali star in this low-budget production about a car salesman who becomes top dog at his dealership while trying to pay off his debts. This movie offers a realistic portrayal the ups and downs of a team of aging sales reps at a real estate office. Starring Al Pacino, Jack Lemmon, Alec Baldwin, and Kevin Spacey, Glengarry Glen Ross is must-watch for everyone who works in sales. A teenager is on trial for murder and will be sentenced to death if found guilty. When Juror Number Eight (Henry Fonda) realizes that he’s the only one who believes in the boy’s innocence, he must persuade his fellow jurors to acquit. This story highlights the importance of understanding your prospect before pitching. While not exactly a sales movie, The Social Network portrays the birth of Facebook during Mark Zuckerberg’s college years. As a student at Harvard, Zuckerberg creates the first social network, only to be sued by a former co-founder as well as two brothers who accuse him of stealing the concept. Ready for a Sales Movie Marathon? So, did your favorite sales flick make the list? Let us know if you have other recommendations for us to watch!